Sight words are those which students can identify automatically without the need to decode. They often do not follow phonics “rules.” Examples: who, all, you, of. They may include some high frequency words (HFW). High frequency words are those which occur most often in reading and writing. By learning 100 of the HFW, a beginning reader can access about 50% of text. According to Fry, these 13 words account for 25% of words in print: a, and, for, he, is, in, it, of, that, the, to, was, you. When are students ready to learn sight words? According to the experts from Words Their Way (Bear, Invernizzi, Templeton), student need to have a more fully developed concept of word. Concept of Word is the ability to track a memorized text without getting off track, even on a 2-syllable word. In other words, does the child have a one-to-one correspondence with words? When tracking, does their finger stay under a 2-syllable word until it is finished, or are they moving from word-to-word based on the syllable sounds they hear? 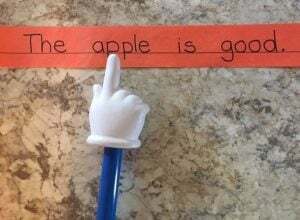 In the sentence shown, does a student move their finger to the next word after saying ap- or do they stay on the whole word apple before moving on? Students in the early Letter-Name Stage (ages 4-6) start to understand this concept. It becomes more fully developed mid to later stages of Letter Names (ages 5-8). Students with a basic concept of word are able to acquire a few words from familiar stories and text they have “read” several times or memorized. Students with a full concept of word can finger point read accurately and can correct themselves if they get off track. They can find words in text. 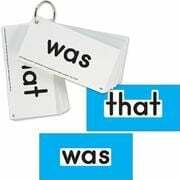 Therefore, many sight words are acquired after several rereadings of familiar text.